Recently finished this commissioned painting of Johnny Cash. It’s going to be a surprise gift for someone special. I am grateful to have had the opportunity to create something memorable. Red, black and iridescent silver acrylic on 28 x 22 x 1.5 gallery wrapped canvas. Image wraps around and is continued onto the sides. Features song lyrics and sheet music to I WALK THE LINE on the background. Splashes and splatters of black and silver paint. View of the underside of painting, image wraps around the sides. The image wraps around the canvas on 2 sides. What you don’t see is the silver glimmer and shine of the iridescent paint as it catches the light. As always I think it looks better in person. 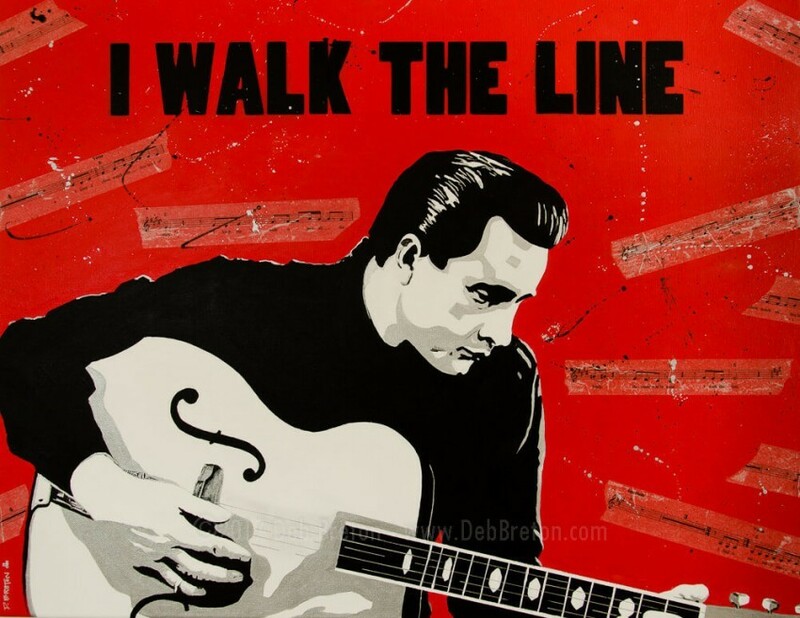 “I Walk the Line” is a song written and recorded in 1956 by Johnny Cash. After three attempts with moderate chart ratings, it became Cash’s first number one hit on the Billboard charts. It reached number 17 on the US pop charts. It remained on the record charts for over 43 weeks, and sold over 2 million copies. As usual, I immersed myself in the music of Johnny Cash while drawing and painting this. Thanks to Spotify, I was able to listen to hours and hours of his music easily. As part of my preparation for painting the piece, I also learned a lot about the history of the man. Much like an actor immerses themselves into the character for the role they are playing. I learn about my subjects when painting them. It helps me flesh out who they are. For instance, Johnny Cash had a scar on right side of his face. That came from having a cyst removed when he was in the Air Force. When I painted that portion of his face I knew that it had to show, because that was a part of him. He also monitored the Russian’s Morse Code chatter announcing the death of Joseph Stalin. Perhaps it’s these little details that help me to know the essence of the person I’m painting? Thanks for your concern John, its been a heartbreaking time. The person who collected this had a clear idea of exactly what she wanted – and a younger JC was the first request! I had a bunch of images/album covers for her to chose from. Kinda like the looks of him young like this!